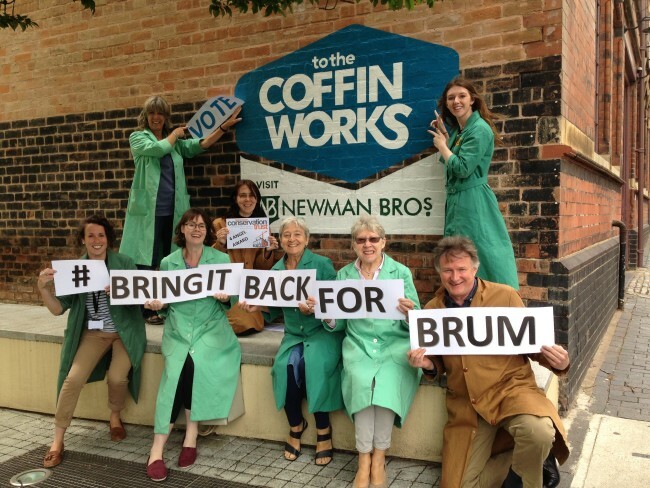 As a proud trustee of Birmingham Conservation Trust, I am delighted to report that we have been nominated for one of Historic England’s Angel Awards, specifically the Best Rescue of an Industrial Building Award, for our restoration of the glorious Newman Brothers at the Coffin Works. However, there is another Heritage Angel award, which we need your help to win: the 2015 Historic England followers’ & Telegraph readers’ Favourite Award will be presented to the project that receives the most public votes. 15 years of hard work, fundraising and a £2m refurbishment paid off when we re-opened the factory in October 2014. The semi-derelict grade II* listed industrial building now has a very bright and sustainable future as both a highly-rated ‘time-capsule’ museum, an events venue, and eight commercial units, which are all fully let! BCT, along with our wonderful team of volunteers, have given the factory a new lease of life and preserved a unique and special slice of Birmingham’s history for the city. Just check out our TripAdvisor Reviews to see how special the museum is! For more information about the work of Birmingham Conservation Trust, click here. 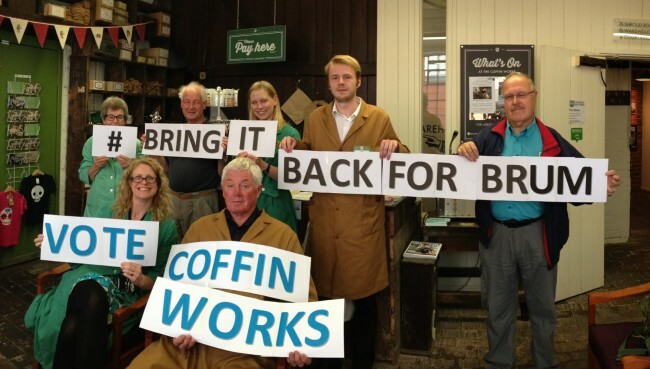 To visit the Coffin Works for yourself, click here. When you follow the ‘vote’ link you are taken to a SurveyMonkey page where you are asked to provide your name, email and telephone number and are asked whether you are ‘a) A Historic England follower b) A Telegraph reader (the Telegraph is one of the award sponsors) c) Both’. Being a ‘follower’ of Historic England means anybody with an interest in their work – i.e. anybody can vote. You can opt out of being contacted by Historic England simply by not ticking the relevant boxes about this. Although, why not follow them on Twitter @HistoricEngland or on Facebook.com/HistoricEngland or subscribe to their newsletter and find out more about the great work that they do.